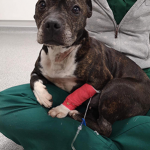 Although this can be a very colourful and exciting time of year for people with firework displays and bonfires, it can be quite a stressful time for our four-legged companions. Fireworks emit light and sound in a spectacular way which can be visually stimulating for people but genuinely terrifying for our pets as they have much more sensitive eyes and ears. If your pet is likely to be anxious or apprehensive, coming up to this annual event, the best thing you can do is plan ahead. Starting a preparation programme 4-6 weeks prior to the planned event can really help reduce the stress levels when the big nights come around. One of the best ways of reducing your pet’s stress levels is by doing something called ‘desensitisation’ or ‘acclimation’. This means increasing your pets’ tolerance to what they are afraid of by exposing them to it in tiny amounts at first and gradually increasing their exposure over time. With noise phobias, this is done by playing the sounds at a very low volume in the background initially and then increasing the volume over time. Ideally, the desensitisation should be done just before something fun happens for example before dinner-time, ‘walkies’, play-time or cuddle-time. This should train your pet to associate the sound with something positive rather than something negative. These sounds are widely available on the internet via YouTube or can be downloaded via the Dogs Trust Website. Another good idea is to build your pet a “Fortress of Protection” or a den. This involves providing them with a quiet, calm spot that they can escape to and hide in at any time that they are feeling unsafe or vulnerable. When choosing a suitable spot, try to choose an area that is generally quiet and away from windows and doors or noisy appliances like washing machines or tumble driers. When picking somewhere for cats, they will often naturally seek refuge either up high (for example on top of a book case or shelf) or underneath furniture if they can’t climb. It is also sensible to have the area covered over so that your pet can climb in and hide if they so choose. An area like this should be set up weeks before the anticipated stressful event to give your pet time to adjust. Try to encourage them to use the space for playing with toys but take care to leave it as their space. You should only enter if they invite you to play, otherwise, leave them to it and they should be free to come and go as they please. 3 – 2 – 1 – Thundershirts™ are GOOOOOOO! Training your pet to wear a Thundershirt (www.thundershirt.co.uk) has also been proved to aid with noise phobias. The Thundershirt is designed to act as a ‘wearable hug’ and can relieve stress in many different situations. It is extremely important to acclimatise your pet to wearing the Thundershirt prior to the stressful event as otherwise it can be associated as a ‘cue’ to a stressful event and can in fact increase the anxiety levels. There are a number of different types of diffusers you can plug into your home to help aid with anxiety. 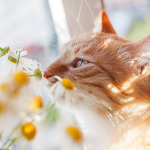 Some contain pheromones or ‘happy hormones’ that act to reassure your pets. For dogs, it is called ‘ADAPTIL™’ and the pheromone is the same one that their mum would emit when they were nursing babies to make them feel relaxed and content. For cats, its ‘Feliway™’ which emits the same pheromone that cats rub onto your leg at feeding time to tell you that you belong to them and that makes them happy! All of these diffusers should ideally be plugged in 1-2 weeks prior to the event. Walk your dog during the daylight hours so that they are good and tired come evening time. Keep your cats indoors and lock the cat flap – make sure they have a litter tray and that they are used to it and aware that it is there. Close the windows and curtains to reduce the noise and the visible flashes of light. Turn on the TV/ radio or let them watch their favourite YouTube channel. Set the volume just loud enough to muffle out the sound of fireworks. Try to keep yourself calm. If you are anxious about their behaviour, they will reflect this. Talk reassuringly to them but do not make a fuss. Act as though everything is A-O-K! If you are frightened, this may convince them that there is something to fear! If they are hiding in their ‘Fortress of Protection’, don’t try to coax them out. If they are behaving calmly, praise them for being brave. If not, don’t scold them for being anxious. If your dog has a big brave friend who is not scared of fireworks, invite them around to play together. Don’t forget to have your pet microchipped before-hand just in case all of the above fails and they manage to escape. At least this way you will have the best chance of getting them back! As a final word, if you are responsible for lighting a bonfire, please be conscious that if the bonfire has been pre-built for days or weeks before being lit, it will have become a hotel for hedgehogs trying to settle in for their winter nap. Please try to ensure that there are none sleeping in the bonfire before lighting it by either moving the whole lot by 20m or lifting the bottom layer and listening for any sign of movement. Happy Diwali/ Halloween/ Bonfire Night/ New Year to all our (2-legged and 4-legged) friends!